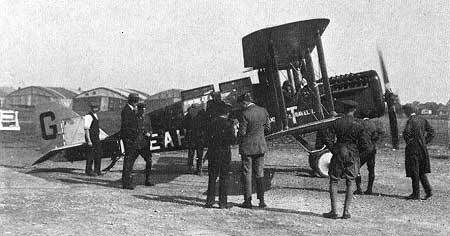 The aircraft left Paris-Le Bourget in the morning bound to Hounslow Heath, near Heathrow, London. While approaching the airport of Kenley, south of Croydon, the aircraft went out of control and crashed in an open field. While the passenger was killed, the pilot was seriously injured. Two days later, he died from his injuries. Mr. Rand was returning to London following a meeting with the French Prime Minister Georges Clémenceau in Paris. Lt Stanley Blackall Bradley, pilot. George Franklin Rand, President of the Marine Trust Company in Buffalo, New York. The cause of the accident could not be determined. However, it is believed that the pilot was either trying to land at Kenley or was trying to pinpoint his position.